Top left: U.S. Consul General Jennifer Galt speaks at the opening ceremony of the Sea Turtle Shelter; Bottom left: U.S. Consul General Galt and student volunteers carry an endangered turtle back to the sea; Right: Government officials and students look on as Sea Turtles 911 Founder Frederick Yeh guides three rehabilitated turtles back to their ocean home. With ongoing disputes in the South China Sea, there is one marine issue that the U.S. and China proudly agrees on: saving sea turtles from extinction. Officials from the United States Consulate General and the Ministry of Agriculture of the People’s Republic of China joined Sea Turtles 911 to release three rehabilitated sea turtles back to the South China Sea. “Our governments must continue to work together to develop policy and programs that protect our most precious resources, businesses must play an active role in responsible development, and groups like Sea Turtles 911 must continue to fight for protection of local resources like sea turtles through education and outreach,” said U.S. While the crowd watched, the rehabilitated turtles began their second chance in life as they scrambled safely back to their ocean home. Four months ago, the sea turtles were injured by plastic pollution and rescued by Sea Turtles 911. The turtles immediately became internet stars after an online campaign raised awareness about their rescue and conservation. Two of the rescued turtles were endangered green sea turtles (Chelonia mydas) named “Ye” and “Qiu”, while one of the turtles was a critically endangered hawksbill sea turtle (Eretmochelys imbricata) named “Tutu”, after an online voting poll that involved tens of thousands of people from the internet community. 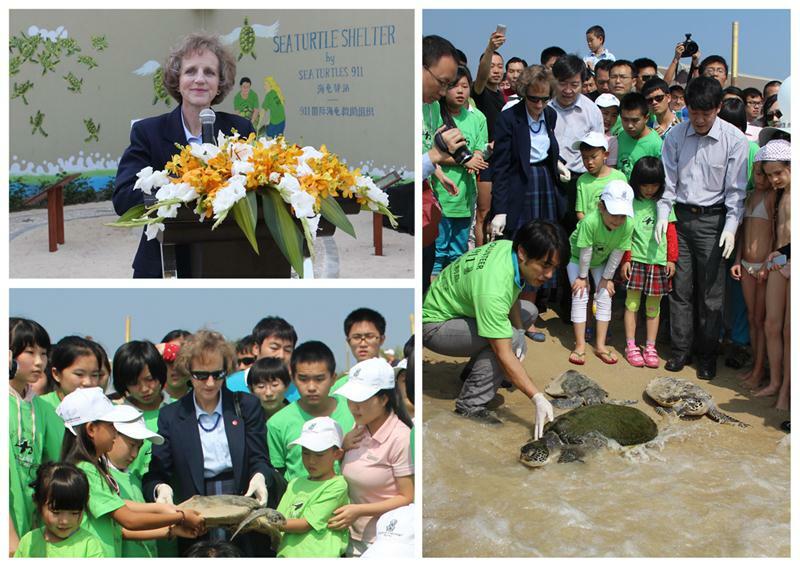 The turtle release event marked the opening of Sea Turtles 911’s Sea Turtle Shelter at the Ritz-Carlton Sanya in Hainan, China. The shelter serves as an educational facility to raise public awareness on the plight of sea turtles, while providing a home for disabled turtles unable to survive in the wild, and a temporary place to monitor rehabilitated sea turtles waiting to be released. Quasi, a disabled sea turtle named after The Hunchback of Notre Dame, is one of the turtles at the shelter who suffers from scoliosis, a spinal deformity that has left him floating on the surface of the water for the rest of his life. In the wild, Quasi would be an easy target for passing boats and would have difficulty diving to find food on his own; but at the shelter, he is an easy target for people to care for and learn about sea turtle conservation.